A witty, charming fantasy adventure in the world of Strange Practice, starring Dr. Greta Helsing, whose family has been keeping the supernatural community not-alive and well for generations. When Greta Helsing, doctor to the undead, is unexpectedly called to Paris to present at a medical conference, she expects nothing more exciting than professional discourse on zombie reconstructive surgery and skin disease in bogeymen -- and hopefully at least one uneventful night at the Opera. Unfortunately for Greta, Paris happens to be infested with a coven of vampires -- and not the civilized kind. If she hopes to survive, Greta must navigate the darkest corners of the City of Lights, the maze of ancient catacombs and mine-tunnels underneath the streets, where there is more to find than simply dead men's bones. 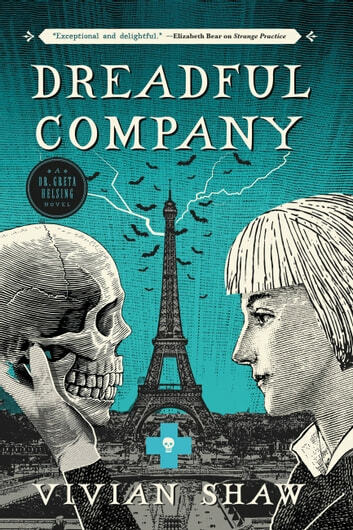 Dreadful Company is the second Dr. Greta Helsing Novel - perfect for fans of Neverwhere and V. E. Schwab. I loved it so much! I think the funny little pop culture references add a lot, especially in the context of immortals. This is also a one of a kind series, in that the main character is my favorite character. Go Greta!